AdWords, operated by the most well-known search engine Google, is a Pay per Click (PPC) based online advertising system. These paid listings appear in the “Sponsored Links” sections found beside and sometimes above the normal (organic) search results on Google’s search results pages. Being featured on the organic search engine results on the other hand is free. The position of one’s website within the search engine results page are ranked solely according to relevance as seen through the eyes of each individual search engine. Although both organic and PPC results are displayed on the same page, there are several differences between them, each with their own advantages and disadvantages. In order to be featured in this reserved space, one needs to specify the maximum amount one is willing to pay for a visitor who clicks on the ad. The actual price per click is determined by Google’s automatic bidding system, which takes several factors into consideration such as the maximum cost per click, competition, keyword relevance, page relevance, etc. Bidding under the Google AdWords program start from $0.01 which promises a very cost effective method of acquiring customers. For competitive keywords, the bidding can soar to a very unattractive $15 per click! First page listings for some of the search phrases under the sponsored results can cost thousands of dollars a day. The major benefit of PPC campaigns is that it can start showing up within hours as compared to organic search results which may take several months to appear. With PPC you are paying for your ads to be displayed when certain keywords are used in a search, hence allowing for much greater control over what advertisement you wish to display, who you wish to display your URL to and when. 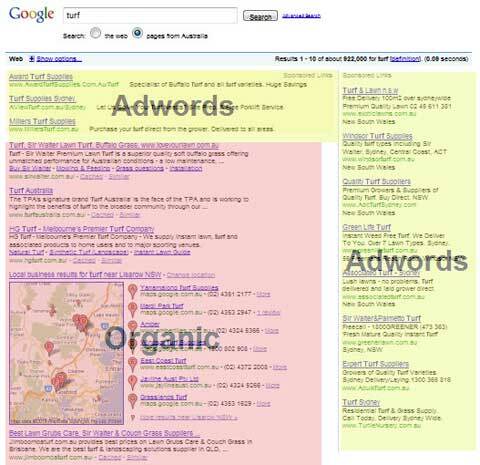 Organic results are on the other hand dependent upon the search engines and their algorithms. Search Engines bots will crawl your website, evaluate it and add your content to their index and rank it compared to the rest of the results they have. When a user submits a search query to Google, it will then retrieve their records and list in according to what they think is the best match to entered search query/search phrase. Organic results can be influenced to a certain degree, through a process known as Search Engine Optimisation (SEO). Organic SEO is a compilation of independent methods designed to present your website pages in the best possible light to the search engines. A well optimised web page can rank far higher than a non-optimised page. Organic search engine optimisation typically is the more cost effective option compared to a Pay per Click campaign. Studies have shown that people tend to trust organic results compared to sponsored links because these results are viewed as being unbiased, consequently receiving the lion share of attention and clicks. One such study conducted in 2005-06 concluded that 75% of the search engine visitors reported clicks on organic search engine rankings with only 25% using on the Pay per Click results. One of the drawbacks of organic search engine rankings is the duration required to obtain top listing positions. Older more prominent websites typically require less time than new websites with a newly registered domain. Also the ever changing search engine ranking algorithms means the process needs to be ongoing to be successful. The dream of any website owner is to have top Organic Search Engine Positions for their relevant keywords and phrases that are important to your business, which in turn would deliver a constant stream of qualified traffic to your website. Reaching that position for anything other than niche markets require special services to optimise your website such as SEO. For the vast majority of website owners, a top position on the search results page never materialise. If you find yourself in such a position, you may need the help of SEO specialists. 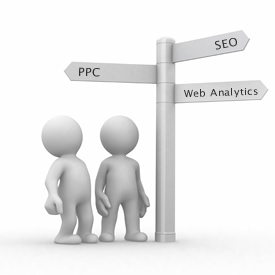 The main argument for PPC is the ability to target a very specific market quickly. 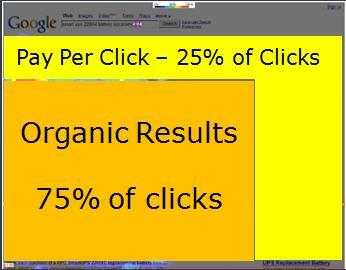 PPC also allows you to run temporary short campaigns (such as a sale) that would be pointless to aim for organically. The downside to this is the potential running cost. Businesses operating in a niche market would be good candidates to succeed with this approach, but would still be more expensive in the long run compare to organic SEO. Organic SEO on the other hand tend to cost less in the long run. As many research results suggest, most users perceive organic results as more accurate/relevant, unbiased and trustworthy, leading to an increase in click through rate and conversion. The major downside is the length of time required to achieve the desired results. Identifying which option to choose requires analysis on a case by case basis. Not all business models can be catered for by Adwords, and organic SEO may not be suitable for others. In reality, the most successful websites tend to utilise a mixture of Search Engine Optimisation techniques, and Pay per Click to maximise the traffic to their websites, and increase their Return on Investment. For more information on how Organise Internet can help optimise your website, please do not hesitate to contact us.